The name of Cassini is widely known, not just within the scientific world, but also by the general public. Usually connected with the field of astronomy, it is also associated with major contributions to cartography. Not so widely known is the name of Maraldi, neighbours and relations of the Cassini family who are also noted for their scientific endeavours, particularly those relating to astronomy. But it is the first of the Cassini line who is generally associated with these two areas of science – though it is debatable which of the two areas was, or has become, more important. Giovanni Domenico Cassini was born in the small hill-top town of Perinaldo, Liguria, Italy on the 8th June 1625. He died in Paris, France on the 14th September 1712 having begun a dynasty that would become famous for its long line of scientists, particularly its astronomers, cartographers and ending with a lone biologist. For 122 uninterrupted years, six astronomers – four Cassini and two Maraldi – worked at the Paris Observatory, an extraordinary record. The small town of Perinaldo sits on a ridge between the valleys of the Rio Merdanzo – a tributary of the river Nervia – and the river Verbone. The top view shows it from the west in Spring, the lower, from the east under snow. The village looks south straight down the Verbone valley to the Mediterranean, and is situated a few kilometers inside Italy from the French border. It was, at the time of Cassini’s birth, a part of the province of Nizza, or Nice, and it was not until 1818 that Perinaldo was incorporated into the province of San Remo. It is believed that the name of Perinaldo is derived from Count Rinaldo, or Rainaldo of Ventimiglia who bought what was then called Villa Junchi in the XIth century, and founded a castle on the site between 1045 and 1055. This became known as Podii Rainaldo – the Hill of Rainaldo – around which grew a small town. Perinaldo had an interesting history, passing through a number of ownerships. Count Oberto of Ventimiglia conceded the fief to Fulcone da Castello, a Genoese in the middle of the 12th century. On the 11th September 1228 Perinaldo was deeded to the Marquis Doria of Dolceaqua in the process of enlarging his influence over surrounding lands – Dolceaqua controlling the western passage to the Rio Merdanzo valley north of and behind Perinaldo. Bartholomew Doria was forced to give Perinaldo away, together with Apricale and Dolceacqua, to Duke Charles 3rd of Savoy in 1524, who administratively reunited it with the County of Nice. Coming under the control of the powerful Grimaldi family of Monaco, Perinaldo had to make an oath of fidelity to the Bishop of Monaco. In 1672 it was looted by Genoese troops and the castle destroyed. The French government’s administrative reforms of 1797 moved the capital of the canton from Dolceacque to Perinaldo, and Napoleon himself, together with one of his generals, slept a night in the Maraldi house in 1794, said to be in recognition of the importance of the Cassini family. Perinaldo remained under the control of Nice until 1818 when it was integrated, still for administrative reasons, into the province of Oneilla (Imperia), by the King of Sardinia, Victor-Emmanuel 1st. Much of Italy suffers from earthquakes and few areas have escaped their effects. In 1887 an earthquake severely damaged buildings in Perinaldo. Now, Perinaldo is situated in Liguria, northern Italy, and has an observatory and museum commemorating not only the Cassini family, but also the Maraldis whose family history is closely interwoven with that of the Cassinis. 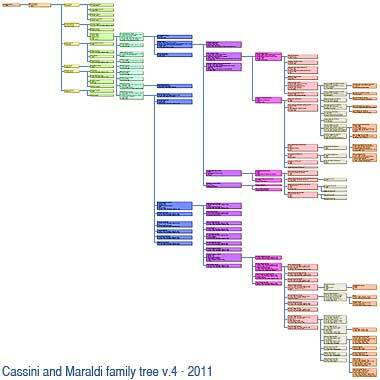 This illustration of the Cassini and Maraldi family tree – which will open in a new window – shows the information I’ve been able to obtain so far. It is now the third iteration of the tree and I believe it is relatively accurate, being based on the two books of Anna Cassini – ‘Gio. Domenico Cassini: Uno scienziato del Seicento’ and ‘I Maraldi di Perinaldo’ together with my own interviews and research in Perinaldo and elsewhere. I do have additional information, including two more generations to add to the eleven shown here, but I have deliberately left the diagram relatively simple. 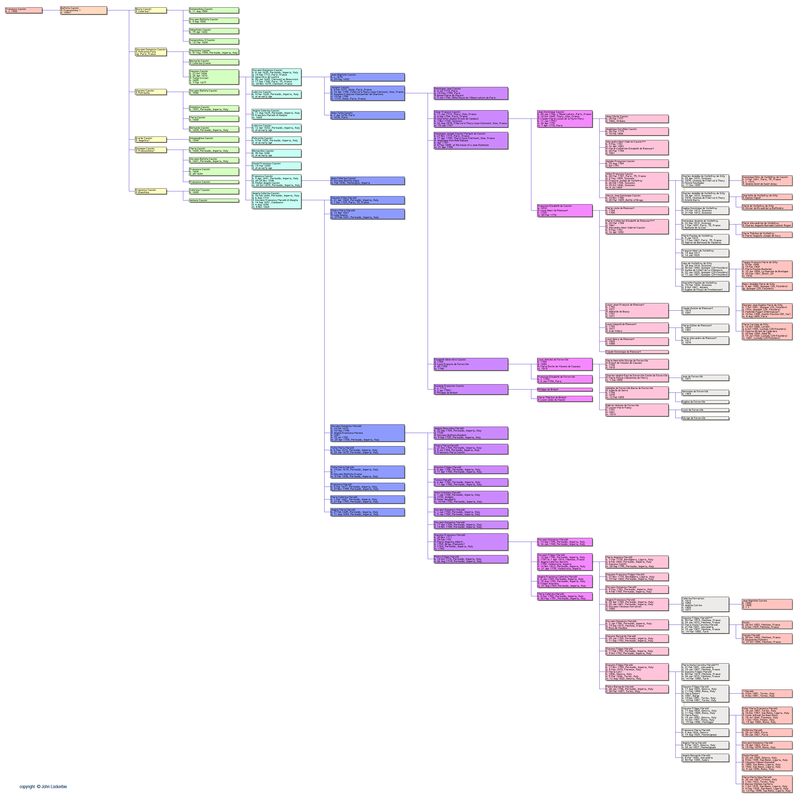 Having said that, I have recently come across information that both differs from and adds to the tree. I shall post it as soon as I can verify which parts of it are accurate, but suspect this state of affairs will continue for the foreseeable future.